The rotary-kiln incinerator is used by municipalities and by large industrial plants. This design of incinerator has two chambers: a primary chamber and secondary chamber. 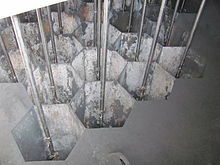 The primary chamber in a rotary kiln incinerator consists of an inclined refractory lined cylindrical tube. The inner refractory lining serves as sacrificial layer to protect the kiln structure. This refractory layer needs to be replaced from time to time. Movement of the cylinder on its axis facilitates movement of waste. In the primary chamber, there is conversion of solid fraction to gases, through volatilization, destructive distillation and partial combustion reactions. The secondary chamber is necessary to complete gas phase combustion reactions.